I love it when I learn things from readers. (It happens more often than you might think.) 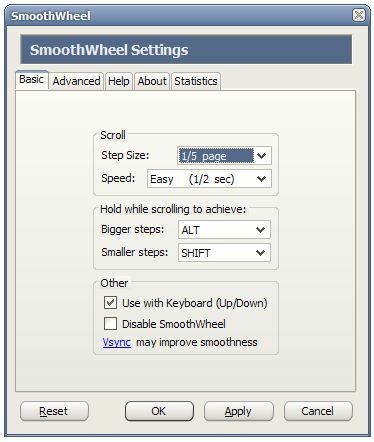 For example, following yesterday's post about turning on Smooth Scrolling in Firefox, reader hijohnhi posted a comment recommending SmoothWheel--a Firefox add-on that he says delivers "the optimum smooth scrolling experience." And you know what? He's right! By default, a turn of the mouse's scroll wheel scrolls your page x amount of distance at a fixed rate of movement. SmoothWheel makes scrolling speed-sensitive, meaning if you turn the wheel slowly, the page scrolls slowly--and if you turn it quickly, the page scrolls quickly. This may not sound like a big deal, but for sites like Facebook, which require a lot of scrolling, SmoothWheel does indeed make for a much better experience. I especially like the keyboard enhancements: if you hold down the Shift key while turning the mouse wheel, the page scrolls in smaller "steps." Hold down Alt for larger steps. Of course, SmoothWheel also makes scrolling look smoother (much like yesterday's tip), so you can more easily read a page while scanning down it. I definitely recommend taking it for a--sorry--spin.